#hawaiilife on Instagram is one of the most popular hashtags in Hawaii. People love to share their daily activities and the beautiful scenery, and we love to share our dream worthy real estate with our followers. Beaches, hillsides, waterfalls, and rainbows. Our state is so picturesque, that it’s hard not to share the beauty. We have two company accounts, which include HawaiiLife and HawaiiLifeMilitary, and many individual agent accounts, some of which are showcased below. Just as the islands are all different, our accounts are different. Check them all out, and follow us on Instagram. The Hawaii Life Military Specialized Team assists military buyers and sellers PCS’ing to and from Oahu. 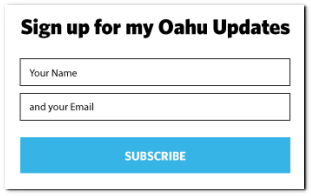 Did you just receive your orders for #Hawaii? Or are you trying to #PCS here? If so, this "Moving to #Paradise—A Guide to PCSing to O'ahu" is for you! #HawaiiLife (link in bio). A highly successful HGTV “Hawaii Life” TV show, a powerful website, and a wide-reaching social media presence. Showcasing our beautiful state and our properties. It’s just some of the ways we bring value to our clients. Keep checking back for updates and a daily dose of paradise. Kinga, I like your blogs!